KINSHASA, Congo (AP) — Congo’s leader is blaming a deadly Ebola virus outbreak for the last-minute decision to bar an estimated 1 million voters from Sunday’s long-delayed presidential election, claiming it would be a “disaster” if someone infects hundreds of people. Protests exploded again on Friday in response as health workers suspended efforts and warned that new cases could sharply rise. In an interview with The Associated Press, President Joseph Kabila contradicted his own health officials and experts with the World Health Organization who have said precautions were taken in collaboration with electoral authorities so people could vote. Those include tons of hand sanitizer — Ebola is spread via infected bodily fluids — and the screening of all voters entering polling stations. Without mentioning the election, WHO Director-General Tedros Adhanom Ghebreyesus warned late Friday that “prolonged insecurity” in Congo could erase recent gains made in containing the second-deadliest Ebola outbreak in history. Work has reached a “critical point,” he said. 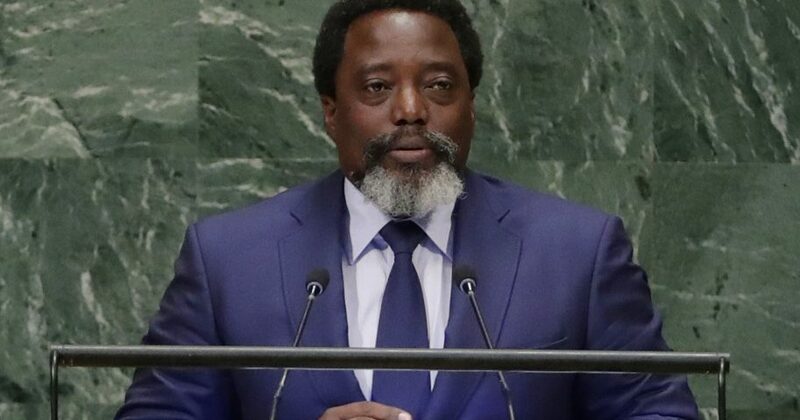 Kabila on Thursday evening claimed that the hemorrhagic fever could spread as people use voting machines, tapping on a touchscreen to select candidates. A polling station could have 500 to 600 voters and “this assumes that a lot of people will be contaminated,” he said. Health officials have said people would sanitize their hands before and after voting. Until this week, the Ebola outbreak declared on Aug. 1 had been a challenge but not a barrier to the election. Voting is now delayed in the cities of Beni and Butembo — but not in other communities with Ebola cases — until March, long after the inauguration of Kabila’s successor in January. Residents had largely supported Kabila in past elections but sentiment has turned in recent years amid persistent insecurity. This latest delay in an election meant to occur in late 2016 has angered both residents and the opposition, which accuses the government of trying to ensure that Kabila’s preferred successor wins. Many Congolese believe Kabila will wield power behind the scenes and protect his assets in a country with vast mineral wealth. Protests broke out in Beni again on Friday, with hundreds of people demanding to vote on Sunday with the rest of the country. Police used live ammunition and tear gas to disperse the marchers who barricaded streets. Some protesters carried crosses displaying “RIP Kabila” and saying his preferred successor, Emmanuel Ramazani Shadary, “will never be our president.” Beni’s civil society urged residents to turn out en masse on Sunday. Others protested in Butembo and Goma city. On Thursday, some protesters attacked an Ebola response center and sent 21 patients fleeing. Many later returned, but the vandalism was the latest setback in efforts to contain the outbreak. Nearly 600 cases have been reported, with more than 350 confirmed deaths. The uproar over the voting delay has “badly disturbed” Ebola response work in Beni and Butembo, Congo’s health ministry said. Health teams barely deployed on Thursday and no Ebola vaccinations could be carried out. The Oxfam aid group said it was forced to suspend Ebola response work. Acting country director Raphael Mbuyi called it “extremely worrying” because previous suspensions have led to a spike in new cases. Congo’s national organization of Episcopal churches called the decision to bar voters “unjust” and urged the election commission to reconsider. Protesters said life has continued in the outbreak zone, with schools open, people going to church and candidates holding campaign rallies. Congo’s president said such activities don’t involve voting machines. There is “no further reason” to prevent Sunday’s election for the rest of the country, Kabila told the AP, adding: “Rest assured, there will be peace.” Police can secure the population, he said. He dismissed opposition allegations that campaigns had faced restrictions, including blocked flights and supporters assaulted. Opposition candidate Martin Fayulu told the AP that up to 5 million of Congo’s 40 million voters might not be able to cast ballots on Sunday, claiming that voting machines had yet to be delivered to some areas. Congo’s president also sounded defiant in the face of international pressure. His foreign minister on Thursday ordered the European Union ambassador to leave the country within 48 hours, citing EU sanctions on Kabila’s preferred successor , Shadary. The former interior minister is under an EU asset freeze and travel ban for obstructing Congo’s electoral process and for a crackdown against protesters angry over the delayed vote. The EU prolonged the sanctions this month. Congo resists what it considers international meddling, funding this election itself. Western observer groups are notably absent. “I have already said that Congo is not a beggar country,” Kabila said. Maliro reported from Beni. Associated Press writer Mathilde Boussion in Kinshasa and video journalist Mark Carlson in Brussels contributed.